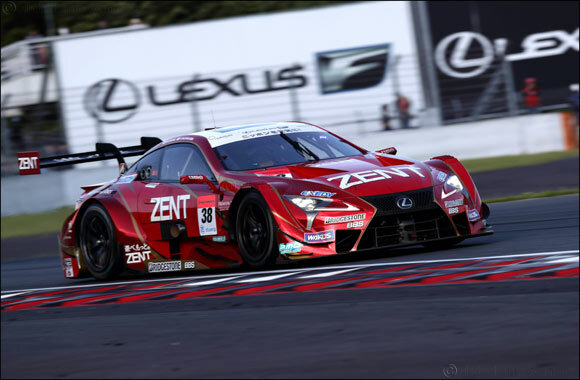 Dubai, UAE – 17 May 2018: Extending its stunning performance at the 2018 AUTOBACS SUPER GT 500 series, Lexus claimed two podium finishes in the second round of the GT500 class held recently at Fuji Speedway. The No. 39 Lexus LC 500 DENSO KOBELCO SARD, co-piloted by Heikki Kovalainen and Sho Tsuboi, finished second, while the No. 38 Lexus LC 500 ZENT CERUMO, driven by Yuji Tachikawa and Hiroaki Ishiura, scored third place in the closely-fought 500-km race. The drama-filled race got underway with the No. 38 Lexus LC 500 ZENT CERUMO, driven by Yuji Tachikawa, in the lead until the team was passed by the No. 23 rival car on the Dunlop Corner of the opening lap. After that, the early stages of the race saw the leading No. 23 rival car being chased by three Lexus LC 500s; the No. 36 Lexus LC 500 au TOM'S, with James Rossiter at the wheel, the No. 39 Lexus LC 500 DENSO KOBELCO SARD, driven by Heikki Kovalainen, and No. 6 Lexus LC 500 WAKO'S 4CR, with Kazuya Oshima in control. Running in the lead, the No. 23 made an effort to put more distance between itself and the rest of the pack. But the No. 39 Lexus LC 500 DENSO KOBELCO SARD, with Heikki Kovalainen at the wheel, managed to pass the competitor car on the 23rd lap and grab the lead. After maintaining its lead until the 37th lap before returning to the pit and making its driver change, the No. 39 Lexus LC 500 DENSO KOBELCO SARD returned to the race still in the lead. And with Sho Tsuboi now driving, it continued its fast pace in the second stint. Despite being a GT500 class debutant, Tsuboi ran with consummate skill, passing one backmarker after another as he met them. In terms of lap times as well, he held his own. For 38 laps, Tsuboi maintained a 5- to 7-second lead over the No. 23 following in second place before making the second pit stop on lap 75 and turning over the No. 39 Lexus LC 500 DENSO KOBELCO SARD to his teammate, Heikki Kovalainen, for the final stint. The exciting battle between the No. 39 Lexus LC 500 DENSO KOBELCO SARD and the No. 23 ensued in a tight contest until the rival car overtook the Lexus machine after its pit stop. The No. 39 Lexus LC 500 DENSO KOBELCO SARD, driven by Heikki Kovalainen and Sho Tsuboi, ultimately finished second, putting Sho Tsuboi on the podium in his very first GT500 race, while the pole-starting No. 38 Lexus LC 500 ZENT CERUMO, co-piloted by Yuji Tachikawa and Hiroaki Ishiura, came in the third place. Meanwhile, the No. 36 Lexus LC 500 au TOM'S, driven by James Rossiter and Yuhi Sekiguchi, and the No. 6 Lexus LC 500 WAKO'S 4CR, with Kazuya Oshima and Felix Rosenqvist at the wheel, secured fourth and fifth places in the race, respectively.